Glaucoma is the most important cause of irreversible blindness in Hong Kong. Primary angle closure glaucoma (PACG) is a subtype of glaucoma with higher morbidity and risk of blindness, and has the highest prevalence in Chinese. We conduct intensive research programs on PACG. Our group is widely regarded as one of the leading clinical research groups on the surgical management of PACG in the world. Since 2005 we have conducted three landmark randomized controlled clinical trials that established the efficacy and safety of lens extraction (of cataractous or even ‘clear’ lenses) as one of the viable first-line surgical options in the management of iridotomized PACG eyes. Lens extraction reverses, at least partially, the anatomical predisposition to angle closure in PACG eyes, reduces intraocular pressure (IOP) and the requirement for glaucoma drugs, and facilitates subsequent glaucoma lasers or surgeries, in particular those that involve the drainage angle. 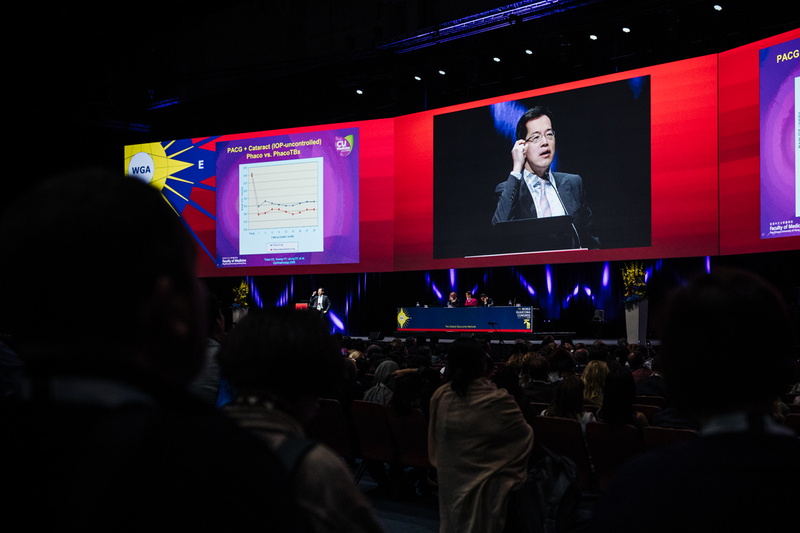 In our earlier randomized controlled trial on acute primary angle closure (APAC), DOVS CUHK established argon laser peripheral iridoplasty (ALPI) as an effective and safe first-line intervention for APAC. Another randomized controlled trial by our research group confirmed that early lens extraction was more effective than conventional laser peripheral iridotomy in preventing the progression to chronic PACG after an acute angle closure attack. 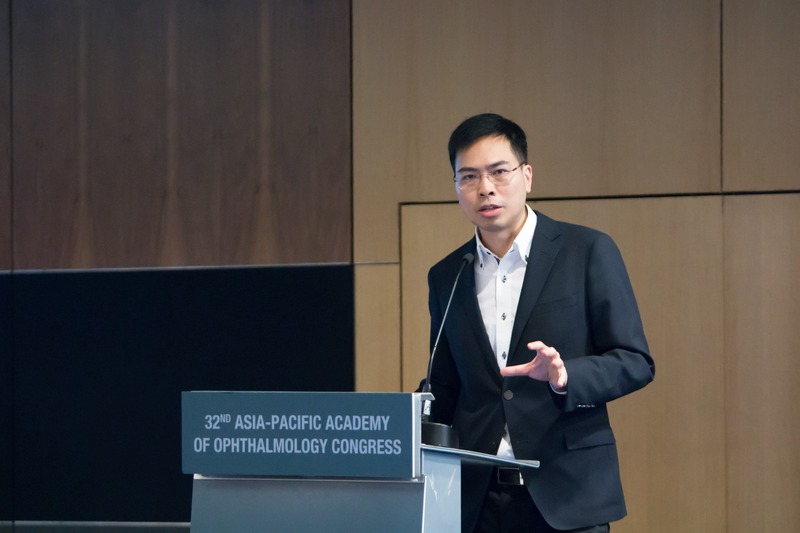 Our other research interests in PACG also include (1) The clinical efficacy and safety of other surgical interventions in PACG eyes, including laser peripheral iridotomy and iridoplasty, trabeculectomy (penetrating, nonpenetrating, carbon dioxide laser-assisted), goniosynechialysis (GSL), glaucoma implant surgery, laser cyclodestructive procedures (transscleral and endoscopic), and various combinations of the above; (2) The anatomical effects of surgery on the anterior segment structures in PACG eyes; (3) Diurnal intraocular pressure profiles in PACG eyes, and the impact of different treatments on pressure fluctuations; and (4) the genetic basis of PACG. Our glaucoma research group has published 4 original papers in Nature Genetics in collaboration with international consortium (Journal impact factor: 31.616 in 2015; Journal Rank: 2/165 in Genetics & Heredity in 2015), 13 original papers in Ophthalmology (Journal impact factor: 6.750 in 2015; Journal Rank: 2/56 in Ophthalmology in 2015), and 34 original papers. Our Principal Investigator, Prof. Clement C.Y. 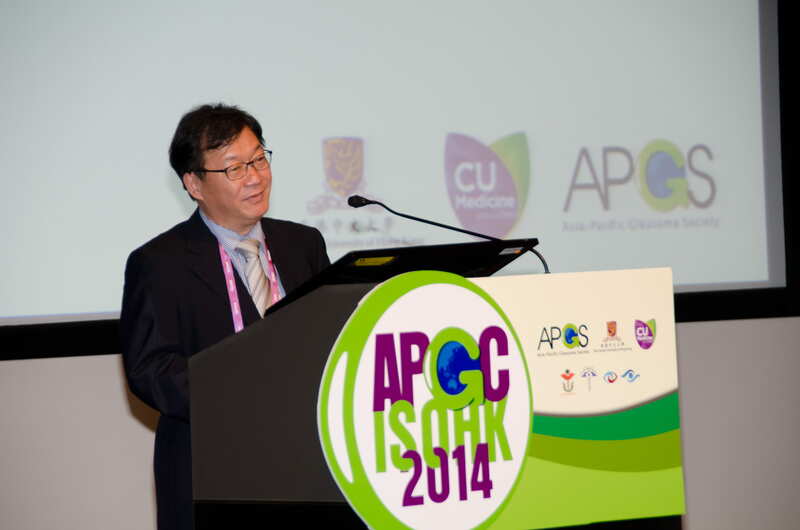 Tham, an internationally-recognized authority on PACG, has been invited to present 9 Named / Award Lectures and over 190 invited symposium lectures and instruction courses on the management of PACG in international scientific congresses, including the prestigious Honored International Lecture at the annual scientific meeting of the American Society of Cataract and Refractive Surgeons (ASCRS), the APAO De Ocampo Lecture, and the APAO Holmes Lecture. CUHK DOVS continues to conduct research in molecular genomics and molecular biology of genetic eye diseases, including: agerelated macular degeneration, polypoidal choroidal vasculopathy, retinoblastoma, primary open angle glaucoma, primary angle closure glaucoma, myopia, and keratoconus. We have made an important discovery in identifying the angiopoietin 2 (ANGPT2) gene as a new susceptibility gene for neovascular age-related macular degeneration and polypoidal choroidal vasculopathy. We have also confirmed the association of the ATP-binding cassette, subfamily G, member 1 (ABCG1) gene with polypoidal choroidal vasculopathy and neovascular age-related macular degeneration. We also further the study of the HTRA1, a susceptibility gene to exudative age-related macular degeneration that we discovered in 2006, by revealing HTRA1 variant had higher cell viability, lower cell apoptosis and was less responsive to anoikis, supporting its protective role. We revealed a protective age-related macular degeneration associated HTRA1 variant, c.34delCinsTCCT in age-related macular degeneration pathogenesis due to its role in RPE cell degeneration. In retinoblastoma, we have determined its novel association of the GHRH-GH-IGF1 axis. We revealed the involvement of GHRH-R in survival and proliferation of retinoblastoma and showed that GHRH-R antagonists can specifically kill the RB cells. This work is published in 2016: Chu WK, Law KS, Chan SO, Yam JC, Chen LJ, Zhang H, Cheung HS, Block NL, Schally AV, Pang CP. Antagonists of growth hormone-releasing hormone receptor induce apoptosis specifically in retinoblastoma cells. Proc Natl Acad Sci U S A. 2016 Dec 13;113:14396-14401. We have published 21 original articles in eye genetics with the Department as the corresponding institution between 2016-2017. We collaborate with national and international consortiums on gene studies that leads to another 15 publications in major journals. Our clinical and experimental research on application of digital imaging technologies for detecting and tracking optic nerve degeneration has received international recognition. We have been actively collaborating with the Department of Ophthalmology at the University of California, San Deigo, Neuroimaging Laboratory at the University of Pittsburgh School of Medicine, Institute of Medical Psychology at Otto-von-Guericke University in Germany, and the Department of Electronic and Computer Engineering and the Department of Chemical and Biomolecular Engineering at the Hong Kong University of Science and Technology to develop technologies for non-invasive imaging of retinal ganglion cells and novel treatment strategies to manage optic nerve degeneration in glaucoma and optic neuropathies. tomography technologies for detection of glaucoma and primary angle closure. We were provided with the latest OCT technologies and perimeters from these industries including the Angioplex (Carl Zeiss Meditec), HFA3 (Carl Zeiss Meditec), Spectralis OCT2 (Heidelberg Engineering), Triton OCT (Topcon), and CASIAII (Tomey), with a net worth over HK$ 6 million. Besides, an agreement is under discussion between CUHK ORKTS and Topcon (Tokyo, Japan) on the licensing of our invention “Detection of disease-related retinal nerve fiber layer thinning (U.S. Application No. 13/898,176)”. A non-exclusive license was signed with Carl Zeiss Meditec on 26 April 2016. Our research group is also currently working on application of virtual reality for assessment of visual disability in glaucoma patients. In addition to three research grants secured for the project in 2016, we have received additional funding (HK$300,000) from TSSSU in 2017. Preliminary results of the study were selected for presentation at the Association for Research in Vision and Ophthalmology Annual Meeting 2017 in Baltimore, USA. A non-provisional patent (U.S. Non-Provisional Application No. 15/466,348) was filed on 22 March 2017. Lily Vision (Shanghai, China) is collaborating with us for commercialization of our invention.